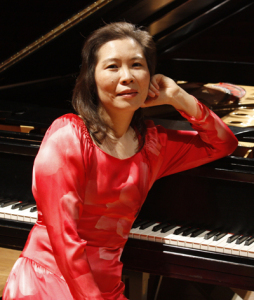 Associate Professor of Music, Yumiko Oshima-Ryan, will present a faculty piano recital in Bjorling Recital Hall on Saturday, September 20. The performance will include two major works by Takashi Yoshimatsu and Franz Liszt. This recital will begin at 1:30 p.m. and is free and open to the public. For this recital, Dr. Oshima-Ryan has selected two major works that are vastly different in character from each other. As with many of her recitals, Oshima-Ryan has included a work by a contemporary Japanese composer. The opening work, “Tapiola Visions” for piano (left hand) Op. 92 by Takashi Yoshimatsu is, as described by Oshima-Ryan, “one that depicts nature written by a Japanese composer and is performed only with my left hand.” The five movements include the composer’s musical visions of twilight, forest, water, birds and wind. A native of Japan, Oshima-Ryan graduated from Toho Music Academy in Tokyo and earned a Doctor of Musical Arts degree at the College-Conservatory of Music, University of Cincinnati. Her piano teachers include Eunice Norton (a pupil of Arthur Schnabel), Eugene Pridonoff, Richard Syracuse, Jerome Rose, and Satoko Tokumaru. She studied chamber music with Menahem Pressler, pianist and founding member of the Beaux Arts Trio. Oshima-Ryan is currently an Associate Professor of Music at Gustavus Adolphus College. Yumiko Oshima-Ryan’s faculty piano recital at Gustavus will begin at 1:30 p.m. on Saturday, September 20. It will be held in Jussi Bjorling Recital Hall in the Schaefer Fine Arts Center. This performance open to the public. Admission is free.